THE BOTTOM LINE: This unveil certainly blows my mind. This controller looks destined to change the face of live DJing by taking the capabilities of the previously released Kontrol S4 to greater heights. The biggest question remains: Is it a stand-alone, and will you be able to ditch your laptop? By the looks of it, I think your Macbook will still be in the captain’s chair until the next bold strategy move in design. 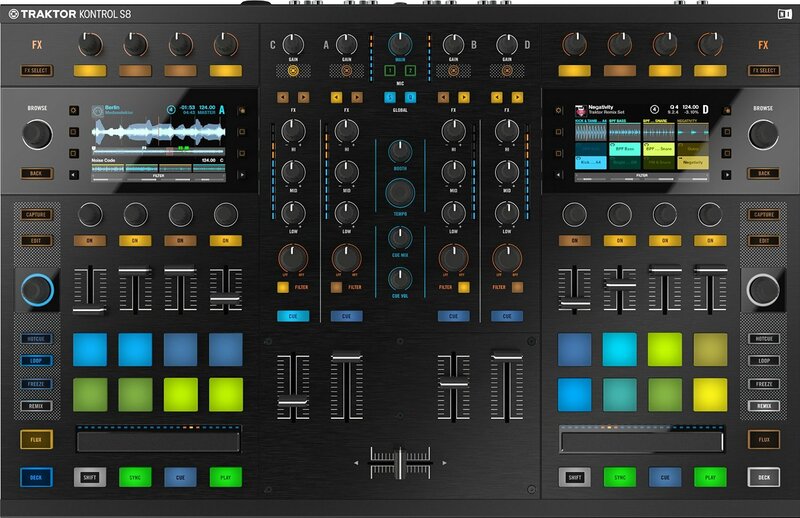 Will this leave Serato in the dust? >>>>> The biggest factor may most probably be the hip-hop DJs. Will they adapt to new realm of controllerism. Will they feel inadequate in front of a crowd without platters or jog wheels, which the Pioneer system faithfully delivers. If the Hip Hop spinsters climb on board, we may see a revolution in the midst, but if they stick to their Serato guns, they will still be missing the huge boat that just left the port. I always feel that we, as DJs, are currently under relentless fire from many idiotic YouTube videos that portray as a bunch of side show charlatans that are making fast money for nothing more than the phantom tweaking of knobs and faders. Native Instruments has wisely charted a path for us to regain the momentum that put us in the spotlights to begin with. And for those of you who are hating this move or refuse to get on board, you have just passed up a glimpse of the future and bonafide level of talent that defines the true nature of a DJ.